Winterlike conditions are expected to wallop the eastern half of the country, from Denver to New York City, as a significant change in the weather pattern takes shape. A major storm is developing in the middle of the country with heavy snow, strong winds and thunderstorms, according to ABC News meteorologists. 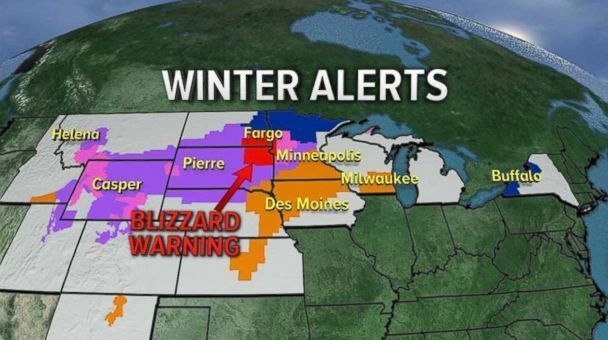 More than a dozen states, from the Rockies to the Northeast, have issued winter weather warnings or watches. The storm system is moving out of the Rockies into the Plains this morning with snow, wind and rain. A line of strong storms with lightning, gusty winds and heavy rain will reach Chicago this evening, meteorologists said. A cold front is expected to reach the East Coast by Tuesday evening, bringing heavy rain and a few thunderstorms. Several waves of cold air are forecast to move through the Midwest and the Northeast this week and into the weekend. The core of the coldest air will moderate as it moves over the Great Lakes and into the Northeast, but it will still feel like a shock to the system after the mild past few weeks, meteorologists said. 0 Response to "Bitter cold and snow threatening parts of eastern US"